GL's RTP ToolBox™ (PKB100) testing and simulation tool is designed not only to monitor RTP and RTCP packets, but also to allow users to manually create and terminate RTP sessions, independent of call-signaling protocols such as SIP, H323, MEGACO, or MGCP. 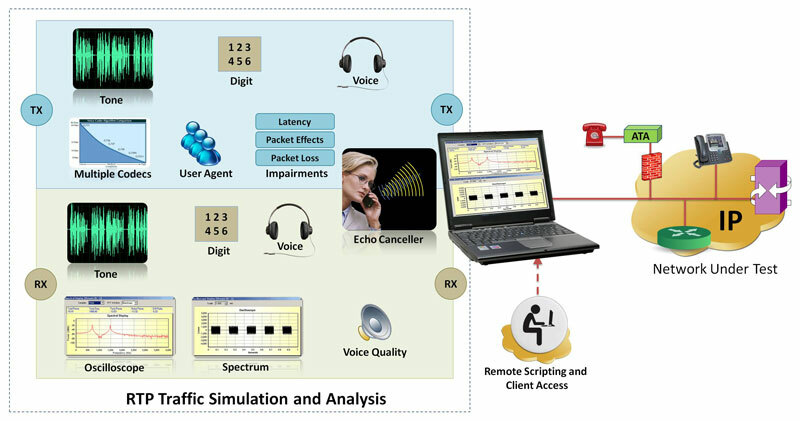 This tool can be used for testing and developing enhanced voice features (VAD, echo cancellation, codec, digit regeneration, digit generation, fax over IP, jitter implementation etc) within end-user equipment (IP phones, ATA, MTA etc), testing media gateway telephony interfaces, end-to-end network testing before and during VoIP deployment, automated testing of digital signal processing embedded into network elements. Testing and developing enhanced voice features (VAD, Echo Cancellation, Codec, Digit Regeneration, Digit Generation, Fax over IP, Jitter Implementation etc) within end-user equipment (IP Phones, ATA, MTA etc). End-to-End network testing before and during VoIP deployment. Testing media gateway telephony interfaces. Automated testing of Digital Signal Processing embedded into network elements. Create RTP sessions & Auto scan incoming RTP sessions; supports IPv6 addressing. G.168 testing for echo cancellation equipment. User-defined impairments: latency, packet loss, out of sequence, and duplicate packets. Talk and play to speaker options using PC sound card. Call generation and reception ability provides UA simulation (up to 8 UAs through CLI). Customize codec options (payload type, ptime) for UA during Call Generation & Reception. Multiple frame interval or Packetisation Time supported for almost all codec s.
Generation / Detection of in-band and out-of-band Digits / Tones (DTMF, MF, user-defined, etc) / Events per RFC-2833 & RFC-4733. Set the RTP traffic properties (payload type, codec) and impairments during auto-scan. Sending and recording of voice files (.glw) with a synchronous Tx/Rx option. Set delay and attenuate for incoming RTP traffic. Monitoring RTP streams and captured data using scalable Oscilloscope and Spectrum Analyzer. Detailed statistical information of RTP and RTCP packets. Quality Metrics with MOS (G.107 based E-model/R-Factor), jitter buffer statistics, degradation factor, and burst metrics are graphically represented. The Call Generation (Dial) & Call Reception features provides various codec parameters in the TX/RX profiles during negotiation. Sampling rate of the codec is displayed for the selected codec. Comfort noise generation is supported for A-law, µ-law and G.726 codecs for sending and receiving payload. An RTP session can be created either ‘Manually’ or using ‘Auto-Scan for Incoming Session’ feature. With Auto-scan feature, the application monitors all incoming packets addressed to the machine on which RTP ToolBox™ is running. If there are any RTP packets in the traffic, then the sessions on which these RTP packets are being transmitted are automatically displayed. For all the codecs, the payload type should match with the values set in the incoming RTP sessions at the transmission end. It is possible to configure the properties for sending/receiving RTP Traffic with Tx/Rx profile option. On transmitting session, users can set the type of codec needed, sampling rate, voice payload type, RFC 2833 payload type, comfort noise payload type, packetization time, SSRC, timestamp, and sequence number for the outgoing Traffic. Users can also assign 'Quality Of Service (QoS)', i.e., IP Type of Service properties such as precedence, delay, throughput, and reliability values to the stream. On receiving session, users can specify a desired voice payload type for each codec, payload type to receive RFC 2833 events, Comfort Noise Payload Type, and set the buffer used for delayed packets that arrive at receiving end (Both static and dynamic jitter buffers are supported). Users can manually introduce Impairments and transmit on the RTP sessions. This includes introducing fixed latency, uniform/normal distributed latency, periodic/random/burst packet loss, out-of-order packets, and duplicate packets. Users may also apply delay and attenuate to the incoming data on a scanned session. Users can create a script that defines the RTP behavior. Scripting provides the users, a greater flexibility to combine Traffic actions with simple programmed scripts. On call establishment, this script can be loaded and executed as shown in the figure above. This option will also allow users to run the scripts automatically on the scanned sessions. Scripts can also be run on multiple sessions at the same time and its progress can be viewed in the Script Contents pane by highlighting the currently executing command of the script. For enhanced testing, users can also write IVR (Interactive Voice Response) scripts. RTPToolBox™ application can be used to generate in-band digits and tones. The supported tones include single, dual, and multi-tones. Supported digits include DTMF, MF, and MFR2 forward and backward digits. The generation of RTP Events/Digits per RFC-2833 & RFC-4733 are also available. Similar to generation, RTPToolBox™ application allows users to capture tones and digits in the traffic. It also displays additional information about the captured signal such as type of the signal, timestamp, event, power, and accept/ reject frequencies. This is completely supported for both in-band digits/tones and RTP digits/events per RFC-2833 & RFC-4733. The application can also record the incoming voice data to file. These files can be compared with GL's optional Voice Quality Testing software, providing PESQ and POLQA score. The ability to send and record files also allows G.168 testing for echo cancellers. The user can configure some codecs for call generation or reception through "CodecOptions.ini" file located in the installation folder. This file contains options such as packetisation time (ptime), payload type, and codec options. It also allows the user to select the codecs to be included in the test scenario, i.e, if the test requires only A-law or u-law be offered then those can be selected and the others omitted. [CODEC_TYPE] - Allows user to select codecs to be offered in call setup. [Packetisation_Time] - Minimum Packetisation time varies for codecs. In oscilloscope the PCM codes (amplitude of the incoming signal) for any selected session are graphically displayed in real-time as a function of time. The spectrum analyzer displays data received in spectral domain (Spectral Amplitude vs. Frequency). A Fast Fourier Transform (FFT) is applied to successive sample sets of the incoming data and displayed in graphic form. The FFT length can adjust the frequency resolution. (from 32 points to 8192 points). Jitter Buffer feature allows you to set the buffer used for delayed packets that arrive at receiving end. Both static and dynamic jitter buffers are supported. Degradation Factor statistics indicate Good quality packets, Packet loss, Packets discarded, Echo level and Regency. In addition to these statistics, RTPToolBox™ also supports Burst Metrics. Quality metrics include various graphs for R-Factor and for MOS Factor. R Factor graph will display statistics such as, R-Listening, R-Conversational, R-G107 and R-Nom. MOS Factor graph will display statistics such as MOS CQ, MOS PQ and MOS Nom. The RTP Toolbox™ MOS call quality reporting is based on the Telchemy VQMon / SA application that reports call quality estimates including Listening and Conversational Quality MOS scores - MOS-LQ, MOS-CQ , and Listening and Conversational Quality R factors - R-LQ, R-CQ. Estimates are based on the ITU G.107 E Model. An typical estimate of the MOS and R-Factor scores for each codec is available in www.gl.com/voice-codecs.html. Statistics reports of RTP and RTCP packets transmitted on a session such as Number of Packets Sent, Packets Received, Dropped Packets, Out of Sequence Packets, Sender Reports, and Receiver Reports are also displayed using RTP/RTCP statistics applications. RTPToolBox™ can be configured as server-side application, to enable remote controlling of the application through multiple command-line based clients. Supported clients include C++ and TCL based clients. Supported clients include C++ and TCL based clients. With additional PKB110 licensing for Server-Client, user can remotely perform all functions such as creating RTP sessions, Digit/Tones/Event generation and reception, setting impairments, creating session profiles & so on. User can also generate and receive SIP calls through commands. The RTP sessions associated with the SIP call are created automatically. Sample C++ Script 1 - illustrates how to monitor and transmit digits, tones, voice files, rfc2833 events and more. Sample C++ Script 2 - illustrates the process of configuring user agents, establish a call and scanning for traffic. The RTP ToolBox™ application provides multiple features to perform Voice Quality Testing over IP networks. The software can send and record the voice files over the "network under test" either manually through GUI or programmatically through client-server scripts. Different codec types, impairments, jitter buffer, and latency events can be set to simulate the necessary network conditions. Complete automation can be accomplished using the TCL client scripting. The following applications are described in detail. The VQuad™ software is used for sending and recording the voice files across various networks. The Universal Telephony Adapter (UTA) supports interfacing between the telephone and the handset, allowing audio to be injected and recorded through the phone and across the given network. The VQT software is then used to perform PESQ and POLQA measurements simultaneously, using the two voice files (reference and degraded files from VQuad™) and provides the algorithm results along with analytical results, in both a graphical and tabular format.